The following is intended as a helpful guide and reflects the best of our knowledge, at the time of publication. Each training organisation & regulatory body has its own selection criteria. We advise you to confirm all information directly with courses and professional organisations (last updated: September 2018). The Foundation course can be taken as a stand-alone qualification, or as a first step towards further qualifications, as described below. You might choose to take the Foundation Course as a stand-alone qualification in order to develop counselling skills and theoretical knowledge for personal development or use within another role, such as: management; teaching; medicine; social work; befriending or nursing. Some people will use the Foundation Course as a first step towards becoming a general counsellor or psychotherapist. Following a foundation course, in order to become a counsellor or psychotherapist, you will need to undertake at least one higher level training course, usually a diploma level course and/or an MA/MSc or other professional course.The Foundation Certificate Course is supported and endorsed by the LDPRT and NAOS, organisations which provide therapy training. Before starting on a diploma-level course you may need to have had some therapy yourself. Students often continue therapy throughout the training. During this further study you will usually also be expected to undertake supervised practice. As well as pursuing appropriate study, you may also seek to become registered and/or accredited by recognised bodies such as BACP and UKCP. We have developed our courses and association with other organisations to offer our students clear paths to qualification and accreditation. Links are given at right/below (depending on your browser) for all the acronyms used. With the LDPRT, you can seek COSRT accreditation. To apply for this, at least one year must have passed since completing the Diploma, and you will also need to have completed at least 320 hours of supervised practice (200 whilst in training and a further 120 hours after award of the Diploma). Please note that the post diploma requirement is likely to increase, due to changing requirements of the external body. The Foundation course is one element of the required entry qualifications for The London Diploma. Prospective applicants must also have undertaken face to face work with adult clients under clinical supervision (no less than 50 hours), and have had or currently having personal therapy. Applicants to the LDPRT must successfully complete the Foundation. Those hoping to take the LDPRT after the Foundation will also need to take part in, and be successful in, the LDPRT selection process. This will include a group interview: these interviews will usually be held between February and May each year. Advice about these entry requirements and the application process will be given at the Foundation interview and again early in the Foundation year. Please feel free to contact the course director if you have questions now. It is also possible to register with UKCP as a Psychosexual and Relationship Therapist or Couples Counsellor/Psychotherapist. 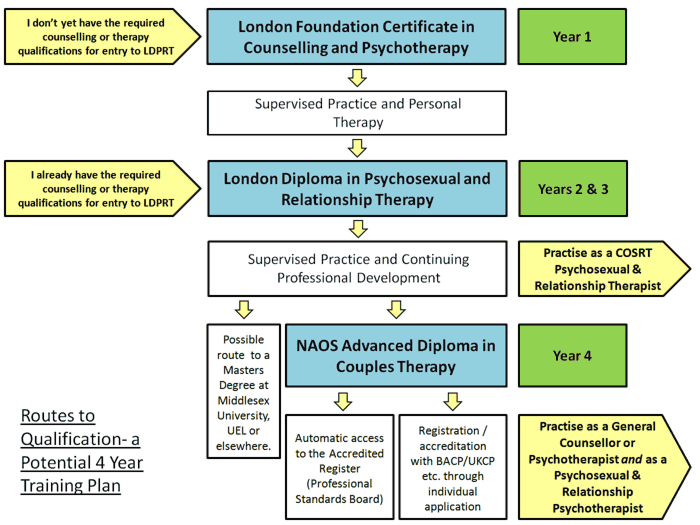 In detail, this means that upon completion of the LDPRT and the Advanced Diploma in Couples Therapy with NAOS, and having fulfilled the written and clinical hours, according to COSRT guidelines, this may be one of several routes to UKCP registration. Some graduates will utilise the accumulated credits from LDPRT to add on a dissertation and work towards an MA from Middlesex University or other universities, using a CAT scheme. UKCP registration must be applied for via one of the UKCP colleges or member organisations within UKCP such as the CSRP which represents COSRT. Once you are working as a member of any of these professional counselling, psychotherapy or PRT bodies, you will also be expected to undertake continuing professional development and supervision. We may be able to recommend low cost therapists/counsellors to you. Please note that the information provided here is correct, to the best of our knowledge, at the time of publication (September 2018). Each training organisation and regulatory body has its own criteria for selection. This is intended as a helpful guide. However, we advise you to check the websites of courses and professional organisations, as you should be mindful that lead bodies regularly adjust and change their requirements. The profession continually strives to adjust and manage its regulations in order to offer clients the best service. You are currently on the foundation course website. A highly regarded psychotherapy and coaching training organisation providing a wide range of courses for both individuals and organisations. LDPRT graduates will find the NAOS Advanced Couples Diploma of specific value and interest. The three organisations above have some faculty members in common and a common approach of integrative humanistic psychotherapy. They have come together to provide a 3-step training pathway (see flowchart), bringing together psychosexual and relationship therapy and psychotherapy. This may lead to individual accreditation with both PRT and Psychotherapy bodies. Professional regulation of psychotherapists and psychotherapeutic counsellors. See the UKCP website for information on UKCP registration which usually requires a Masters degree or the completion of four years of study which includes research and a dissertation or extended case study, of 8,000 – 12,000 words.